Two members of the UW System Board of Regents invested in a hotel renovation project arranged by the UW Oshkosh Foundation, according to documents filed in an ongoing bankruptcy case. The UW Oshkosh Foundation has filed an $18.5 million claim against the school, arguing that “chaos has ensued” because of the university’s “exceptional and egregious” behavior. The claim represents about $18 million in loans, out-of-pocket costs and other liabilities associated with three real estate projects that the foundation financed at the behest of university officials. The rest of the money would cover the mounting legal and administrative costs of dealing with the situation. “Although the university continues to enjoy the benefits of the projects, it refuses to uphold its side of the bargain,” the foundation said in a extensive filing dated June 28 and submitted to the U.S. Bankruptcy Court in Milwaukee. The UW System says it has a policy against commenting on litigation. But it has argued in court that it is not responsible for the financial guarantees made to the foundation because those commitments are not valid debts under state law. The promises were executed by former officials who have since been hit with criminal charges of misconduct in office. The argument that the university’s promises are not legally enforceable obligations has been rejected by the bankruptcy judge hearing the case. In fact she invited the foundation to file for summary judgment in April, signaling that she would rule in its favor. The state has since brought criminal charges against the onetime UW Oshkosh officials who made the commitments to the foundation, former Chancellor Richard Wells and Vice Chancellor Thomas Sonnleitner. The foundation suggest in its filing that the criminal charges support its position by showing that the state believes “its own agents committed felonies by guaranteeing the projects.” In other words, there would have been no crime if the guarantees were meaningless pieces of paper. The foundation filed for bankruptcy last summer after it failed to negotiate an out-of-court settlement. The case revolves around the financial troubles of three nonperforming real estate projects: two biodigesters and a campus conference center. A fourth project that the foundation financed at the urging of the university, the renovation of a waterfront hotel in downtown Oshkosh, has been a financial success. 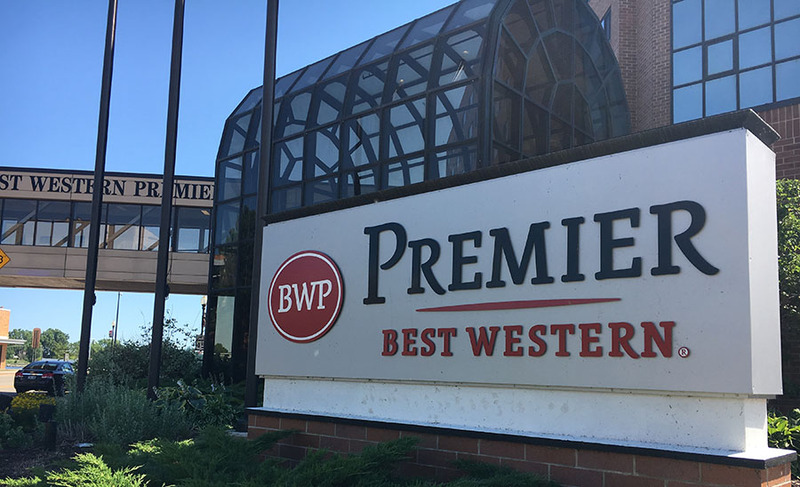 According to court documents, the Best Western Premier Waterfront Hotel and Conference Center has paid annual dividends ranging from 6 to 10 percent while supporting the community’s commitment to tourism as a key component of the local economy. The foundation has pointed to this project as strong evidence that its arrangements with the university were consistent with the school’s strategic goals, were disclosed to the board of regents and were entered into with tacit approval of the UW System. The hotel investment was such a good deal that two members of the UW board of regents put their personal funds into it. The foundation’s new filing identifies these investors as Tim Higgins, an Appleton businessman who is no longer listed as a regent on the board’s website, and S. Mark Tyler, a Woodville business owner who serves as president of the Wisconsin Technical College System Board and chair of the Governor’s Council on Workforce Investment. They sold their interests in the hotel after the UW System began probing the foundation’s dealings with UWO. According to court documents, the seeds of the dispute between the foundation and the university were sown in 2010, when the university “embarked on a series of projects benefiting itself and the city of Oshkosh.” The effort started small and included fairly traditional objectives, such as supporting the university sports complex, building an athletic training fund and raising money for engineering technology. The idea was that these new “single-purpose entities would obtain financing to construct the projects, and the foundation would, in turn, enter into or guarantee the loans, which would in turn be backed by the university,” according to the foundation’s filing. The foundation’s board of directors had been successful in raising funds for the university through standard means, but the members were less comfortable with the real estate investments the university was pursuing. Consequently the directors asked Wells and Sonnleitner for oral and written assurances that they and the university had the authority to provide financial guarantees in case problems arose, court papers show. At a June 2012 meeting the foundation directors discussed the situation with the two UWO officials and in the presence of Deborah Durcan, vice president of finance for the UW System and an ex officio member of the foundation’s board, according to court documents. At that meeting, the then-chancellor said the university had the authority to guarantee the debts that the foundation was taking on. Her silence on the matter led the board to believe that Wells and Sonnleitner were acting within the scope of their authority in offering the university’s financial backing to the real estate projects, Mulloy said. Durcan did not agree to be interviewed by the investigator whom the state hired to look into the foundation’s real estate deals, and efforts to reach her for comment have been unsuccessful. In its new filing, the foundation explained that it pursued the real estate projects based on policy direction from the top of state government. Several years later, “around 2011, the University of Wisconsin System’s budget came under significant stress because of large budget cuts by the Scott Walker administration,” Mulloy said in his affidavit. After budgets cuts of $66 million in 2011, “the board of regents encouraged UW campuses to become more entrepreneurial to make do with less,” he added. $9.4 million related to the Rosendale biodigester. $6 million related to the Alumni Welcome and Conference Center. $2.6 million related to the Witzel Avenue biodigester. $213,000 in legal fees for its bankruptcy lawyers at Steinhilber Swanson. $160,000 in legal fees owed to another law firm, Michael Best & Friedrich. The foundation’s filing includes supporting affidavits from two of its lenders. One of them is signed by Michael Dempsey, a UW Oshkosh alumnus who serves as president of Bank First National and of Waterfest, the city’s long-running summer concert series. “Bank First National finds it shocking and offensive for the university, under these circumstances, to now attempt, years later, to renege on the promises of guaranty it made which induced us to make the loan on this project,” Dempsey said in his sworn statement. While the court filing shows the parties to be far apart, it also points to a possible compromise. For example, if the university came up with the $6 million owed on the conference center, it might then take possession of the facility and argue that the net cost to taxpayers was negligible. you know, the best way for buyers/sellers to stay away from real estate scam that is they should find best real estate agents near them. Good realtors will help you to save much time..and project you from scam. for example, here is the list of top real estate agents in Minneapolis, MN where I usually work with them.